Thermalright has announced the launch of two new sinks to processors for equipment micro ATX and mini ITX. The new sinks are male and 90 Silver Arrow ITX. 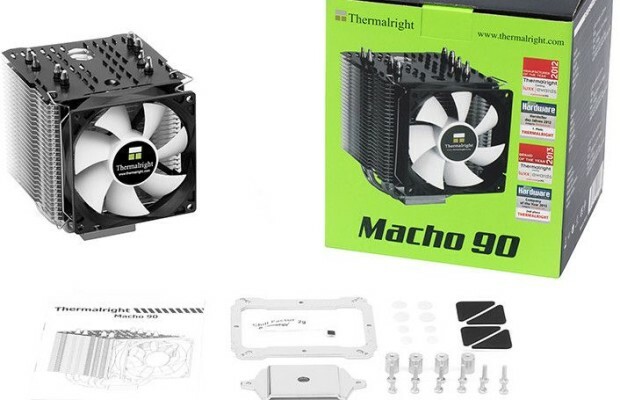 The Thermalright Macho 90 is a sink with a height of 135 mm so it is ideal for compact and Thermalright Silver Arrow ITX is a mini ITX refrigerator equipment without reducing the possibilities of these systems boxes. It has four copper heatpipes nickel plated 6 mm thick, top black anodized and is accompanied by a 92 mm PWM fan that runs at 800-2000 RPM producing a maximum noise of 27 dB. It supports almost all current Intel and AMD sockets for LGA 2011 requires a mounting kit is available separately. The Silver Arrow ITX belongs to the Silver Arrow series and its fans has been created in collaboration with Asus for their colors combined with products from Asus ROG series. This sink is intended for mini ITX but allowing teams to achieve excellent thermal performance thanks to its design of two towers and the 140mm fan. Its design allows modules to install large memory and graphics cards without problemas. Its dimensions are 154 × 103 × 165 mm and a total weight of 870 grams. Heatpipes has six copper plated 6mm thick and TY fan 149 has a function to regulate the PWM speed from 300 to 1,300 and emits a noise of 24.9 dB maximum. It supports all current AMD and Intel sockets. The Thermalright Silver Arrow ITX be available for about 59.99 euros and 90 Thermalright Macho about 29.90 euros.